I made this for my mum to give to my brothers girlfriend. 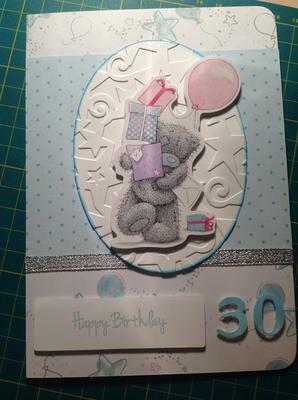 I love the green that has been used for this card, and the embossed background to the bear makes him stand out. I am sure that this card was well received and the birthday girl certainly had a good selection from your family. What a cute card. You have given me some inspiration as I also have xcut dies so another idea to put in the pot, thanks.